It’s day two of Preservation Week. Please enjoy this tip of the day. Don’t forget to stop by our table in the library concourse from 2-4 today to meet Preservation staff and learn about conservation treatment. Did you know, cotton gloves are not generally recommended when handling paper artifacts. Clean, dry hands are preferred. Gloves are appropriate when handling items that may be affected by skin oils such as photographs or metal objects. Thursday, April 25, at 2pm. Sign-up here to receive your access link. This presentation highlights basic archival care for common family treasures such as photo albums, loose photographs, Bibles, clocks, jewelry, and more. Dozens of photos illustrate proper storage practices, and damage resulting from poor storage and common hazards such as silverfish, mold, and acid migration. Discover what to save when you inherit a houseful of “treasures,” how and where to store your keepsakes, and how to set up a home archive so you can easily access items for research and sharing. Don’t store them in areas with excessive amounts of light — especially daylight or fluorescent. Avoid shelving them in locations with extreme temperature and relative humidity or rapid fluctuation in environmental conditions. Avoid placing bookshelves against outside walls or near sources of heat (e.g., fireplaces or radiators). Where books are in regular use, a steady temperature of around 70° F and 50% relative humidity is recommended. The rate of deterioration accelerates as temperature and relative humidity levels increase. The Association of Research Libraries (ARL) is accepting applications for the 2019–2020 Fellowship for Digital and Inclusive Excellence, a program that introduces undergraduates from historically underrepresented ethnic and racial groups to the library and information science discipline. The Fellowship for Digital and Inclusive Excellence offers a paid internship with a focus on digital stewardship in a partner ARL library or archive, participation in the ARL Annual Leadership Symposium, formal mentorship, financial support for student membership in a professional organization, and attendance at a capstone institute. Participants will develop leadership skills and will receive training in topics related to diversity, equity, and social justice. This program is funded by the Institute of Museum and Library Services (IMLS). For more information about the program and the application process, visit the Fellowship for Digital and Inclusive Excellence webpages. The Association of Research Libraries (ARL) is a nonprofit organization of 124 research libraries in Canada and the US whose mission is to advance research, learning, and scholarly communication. The Association fosters the open exchange of ideas and expertise, promotes equity and diversity, and pursues advocacy and public policy efforts that reflect the values of the library, scholarly, and higher education communities. ARL forges partnerships and catalyzes the collective efforts of research libraries to enable knowledge creation and to achieve enduring and barrier-free access to information. ARL is on the web at ARL.org. Please note that the application window is short (due April 18, 2019). Also note that this is an executive-level job and as such the ideal candidate should have experience managing a center, school or large department. Africanists should still apply because the languages listed as the most critical competencies for the job only apply to 1/3 of the countries and regions covered by the African & Middle Eastern Division. Anyone may apply – By law, employment at most U.S. Government agencies, including the Library of Congress, is limited to U.S. citizens. However, non-citizens may be hired, provided that other legal requirements are met and the Library determines there are no qualified U.S. citizens available for the position. Sandow Birk is a renowned artist whose work critically addresses social issues in American culture. He has translated and illustrated a modern vernacular edition of Dante Alighieri’s Divine Comedy, setting it in the contemporary United States, and has produced an English interpretation of the Qur’an with scenes of contemporary American life as visual metaphors. His creative images accompanying the Qur’an and the Divine Comedy pose questions about the limits of interpretation, the relationship of text and image, and the role of the arts in social and political critique. All are welcome to join us for a talk and conversation with Birk about his work on March 27 at 4pm in Rare Books & Special Collections located on the 1st Floor of Hesburgh Library. The Institute for Scholarship in the Liberal Arts, the Devers Family Program in Dante Studies, the Center for Italian Studies, the Program in Liberal Studies, and Hesburgh Libraries. Additional Details: The Office of Grants & Fellowships at the Graduate School will offer a one-hour presentation for all interested graduate students about the Fulbright US Student Program. The presentation will give an overview of the program and its application, as well as the advantages to participating as a graduate student researcher or teacher, followed by time for Q&A. The goal is to encourage ND graduate students to apply to the Fulbright program, to spend a year conducting research or teaching English overseas, and to begin preparing their applications well in advance of the Fall deadline. The session will run from 2-3pm, with 30 mins on either side for setup and clean up. This event is open to anyone who wishes to attend, targeting ND graduate students. Hesburgh Libraries Upcoming Workshop: Register Now! Geographic Information Systems (GIS) is a computer-based platform used for the storage, visualization, analysis, and interpretation of data to understand spatial relationships, patterns, and trends in geographic data. This workshop will teach participants the fundamentals of GIS, including data types and applications, and offer examples of GIS software and live demos. 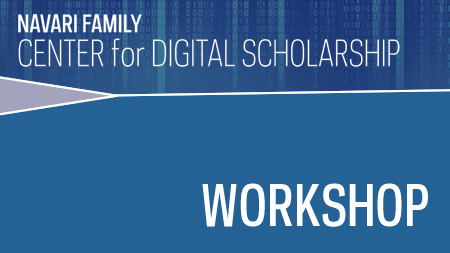 Hesburgh Libraries: Navari Center for Digital Scholarship Workshops: Register Today!